HubSpot announced a new native CRM at INBOUND14. The new system was built from the ground-up to integrate with the HubSpot suite of inbound marketing tools and make it easier than ever for sales and marketing to guide potential customers through the sales funnel. The HubSpot CRM takes care of all the little details – logging emails, recording calls, and managing your data – freeing up valuable selling time in the process. Is easy to use. The simplicity of HubSpot’s CRM makes it easy for people to start using it right away with very little setup or training. Your team can focus on selling instead of learning a new system. Reduces extra work. HubSpot’s new CRM works in the background recording every interaction between you and your contacts so you don’t end up with a list of notes to input at the end of each day. Reaches across channels. HubSpot CRM automatically tracks and records your customer interactions across dozens of touch points ranging from your website to social media to phone calls. Database – Collect and store data on contacts, companies, deals, and tasks with a reliable, easy to use database that is built to scale with your data. It automatically creates company records, links up existing contacts, de-duplicates leads, and manages many other details to provide quality data. Timeline – The timeline shows you all the touch points with your customer, including every email, call, note and website visit. It gives you a complete overview on one simple screen. Email – You can send emails right from any contact record. 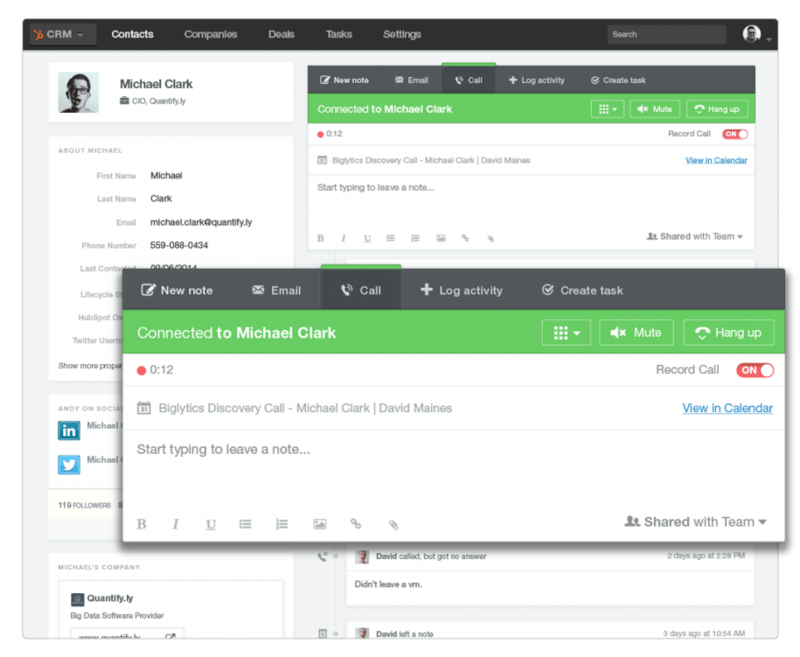 The HubSpot CRM also connects to Gmail, Outlook, and Apple Mail, logging emails with your contacts easily and automatically. Google Calendar Integration – You can connect your Google Calendar to HubSpot CRM to view scheduled meetings and create new meetings in seconds without ever leaving your CRM. Data Enrichment – HubSpot automatically adds valuable information, such as company background, key employees and social data, to your contact records.